Asclepias honors Aesculapius, the Greek god of medicine; tuberosa means bearing tubers and refers to this species’ habit of growing shoots upward from horizontal underground stems. What may look like a patch of several plants may be branches connected by underground tubers, forming a clone. Butterfly-weed in bloom is one of our most easily spotted perennial wildflowers. In mid-to late summer the brilliant orange flower clusters stand out vividly along highways and in fallow fields throughout Virginia. Orange milkweed, as it is also called, has typical milkweed flowers, symmetrical with five petals below an unusual crown, or corona, of petal-like expansions of the fused filaments. Each portion of the corona has a horn curving upward from inside, arching over the center of the flower. The anthers adhere to the stigma, forming a specialized central structure called the gynostegium. Pollen is united into a waxy mass called a pollinium. The plants grow erect with stems from 5 to 30 inches high. Fuzzy, lance-shaped, nearly sessile leaves are alternate, unlike the opposite leaves of other Milkweeds. The shape and the density of leaves on the stem can vary. Also, unlike other milkweeds, the stems of butterfly-weed do not have milky juice. A young plant may produce just one umbel of flowers at the top of a stem, but often the stem branches to produce broad, flat clusters with several umbels of flowers, each about one-half inch long. Seed Pod In the fall, these flower clusters are replaced by one or two narrow, three-inch-long seed pods. These pods, standing upright on stems bent downward, split down one side to release light, wafer-thin seeds, each with a gossamer parachute to aid wind dispersal. Called butterfly-weed because of its attraction for butterflies, this vividly colored wildflower has earned many common names, indicating both its common occurrence and wide distribution. Some of the names reflect associations or ways of recognizing this plant. Finding butterfly-weed in summer is easy. Watch for the flaming patches of flowers in abandoned fields or pastures and along unmowed rights-of-way. The shade of orange may vary from deep butter-yellow to fiery red-orange. Butterfly-weed thrives in a wide variety of soils from sandy loam to heavy clay as long as the soil is not too wet. Usually the plants are scattered singly or in small groups. Occasionally you may discover a spectacular display where plants have become established at the top of a slope and spread downhill. Since they spread both by seeds and by creeping tubers, large patches may develop where the soil is more fertile and the site is sunny and well drained. Butterfly-weed really is “weedy” in that it colonizes disturbed areas, tolerates a wide variety of conditions, and persists in spite of grazing, mowing and plowing. Plants along roadsides often are multi-stemmed and appear almost prostrate, with blooms near the ground, as a result of mowing. Butterfly-weed attracts many different butterflies, especially monarchs and viceroys whose orange and black colors complement the flowers. Although they also draw many other insects, the flowers are pollinated only by wasps that are adapted to butterfly-weed’s intricate flower structure, and some element of luck is also needed. Large numbers of blossoms thus produce very few fruits. Finding butterfly-weed in the fall or winter is more difficult. The green or ripened brown pods are much less conspicuous. However, watching for the open pods with floss shining in the sunlight or following the path of parachuting seeds upwind will be rewarded. Butterfly-weed pods, less woody than other milkweed pods, tend to flatten out as they dry and curl into interesting shapes. Butterfly-weed is an attractive specimen plant in any garden, especially striking as an accent in a perennial border. The dark green foliage stays neat and attractive through the driest summer. Its colors and low habit blend well with other plants, and it adapts to almost any soil with reasonably good drainage. With a gardener’s attention, less competition and more fertile soil than is usual in the wild, a butterfly-weed plant can become bushel-basket size after several seasons and bloom profusely from July well into fall. Not only will its color brighten the garden, it will live up to its name and attract butterflies as frequent visitors. 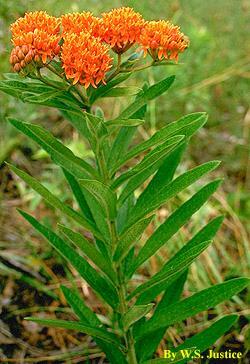 Butterfly-weed is most successfully grown from seedlings or seeds obtained from commercial sources. Sow seeds outdoors in spring or summer at least four months before frost. Sown indoors at 68-75 degrees F they should germinate within 21-28 days. Transplant to a permanent location after the second pair of leaves develops. Due to the difficulty of obtaining all of the deep taproot or sufficient tuber to support the plant, mature plants do not transplant well. Too much water, rich soil, and shade are butterfly-weed’s only enemies. Once the roots are established, it is impervious to burrowing animals, fire, over-zealous picking or cultivation. Unlike some other milkweeds, it does not become invasive and can provide flowers and seed pods for bouquets for many years. The flower clusters dry well in silica gel and hold their color for many months. Its range extends throughout the East, Southeast and Midwest, from Minnesota and Ontario east to New York, south to Florida, and west to Texas and Arizona. Four distinct subspecies have been defined over this large range. based on variations in leaf shape. You’ll find butterfly-weed blooming throughout Virginia from July well into September along trails, roadsides, in abandoned fields and pastures, and along power-line and railroad rights-of-way. In Virginia most plants have lanceolate to ovate-lanceolate leaves with even margins, but some show variations. According to the Atlas of the Virginia Flora (1986), butterfly-weed may be found in nearly every county in the Commonwealth, under pine trees in the Coastal Plain as well as along the Blue Ridge Parkway or in the pastures and fields of southwest Virginia. Gardeners should be sure that butterfly-weed and other native plants purchased for home gardens are nursery-propagated plants, not wild-collected.